I too was totally impressed and amazed after reading the history behind the creation of this sambar!great new information for me and was totally happy after reading about the real antiquities behind sambar.This is a traditional south Indian lunch item especially Tamilian kind of sambar prepared habitually in every household and the radish sambar is a special of its kind with its own trademark aroma. This has become one of the important authentic gravy varieties(not only radish instead of it we add other veggies too )that we do it here in our homes mostly once in a week or even twice sometimes.While doing tadka i usually add ghee always instead of oil as it always gives a different lovable taste than adding oil !but its our own wish .while adding tomatoes be careful as we add tamarind as well!if you are adding tangy variety of tomatoes then add less tamarind extract accordingly. Gooseberry sized tamarind soaked and squeezed. 1.Keep ready by taking extract from soaked tamarind. 2.Pressure cook toor dhal with castor oil by adding needed water. 3.Now after that add water to dhal to bring to desired consistency. 4.Now bring to heat and add small onions, crushed garlic,turmeric powder , chilli powder,salt,sambar powder,tomatoes and sliced radish. 5.Let boil till the vegetable is cooked. 6.Now add the extract and boil till the rawness of tamarind subsides. 7.Now take oil/ghee in a pan. 8.Add mustard seeds and when it splutters add asafoetida. 9.Switch off and add vadakam and curry leaves. 10.Now add this to sambar and switch off ,radish sambar is ready to be served with rice. Keep ready by taking extract from soaked tamarind. Pressure cook toor dhal with castor oil by adding needed water. Now after that add water to dhal to bring to desired consistency. Now bring to heat and add small onions, crushed garlic,turmeric powder , chilli powder,salt,sambar powder,tomatoes and sliced radish. Let boil till the vegetable is cooked. Now add the extract and boil till the rawness of tamarind subsides. Now take oil/ghee in a pan. Add mustard seeds and when it splutters add asafoetida. Switch off and add vadakam and curry leaves. Now add this to sambar and switch off, radish sambar is ready to be served with rice. While adding tamarind extract be cautious otherwise it will become more tangy. I add garlic but its optional. I have used Bangalore tomatoes and if the tomatoes itself is tangy then reduce the tamarind extract. I don't add turmeric during pressure cooking dhal,usually I add it later. I some time add red-chillies for tadka and sometimes I skip adding. 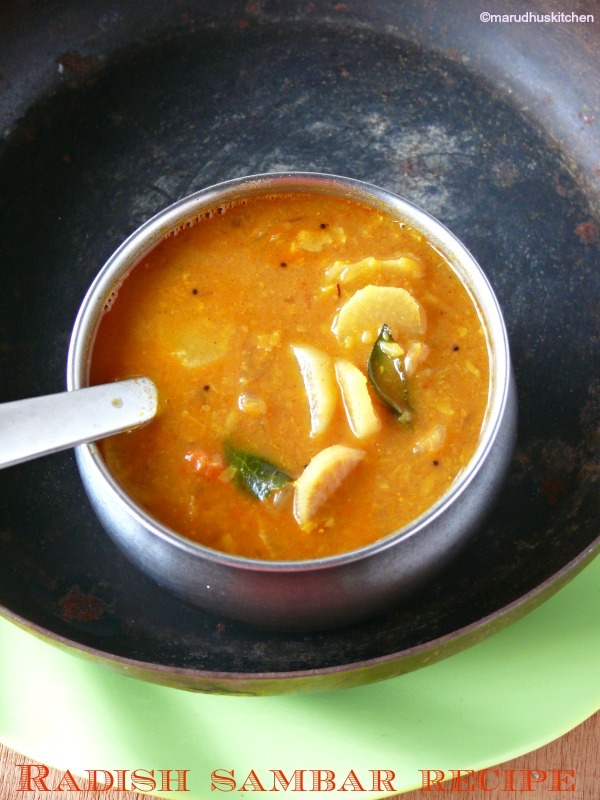 Adding vadakam gives special flavour to this sambar. 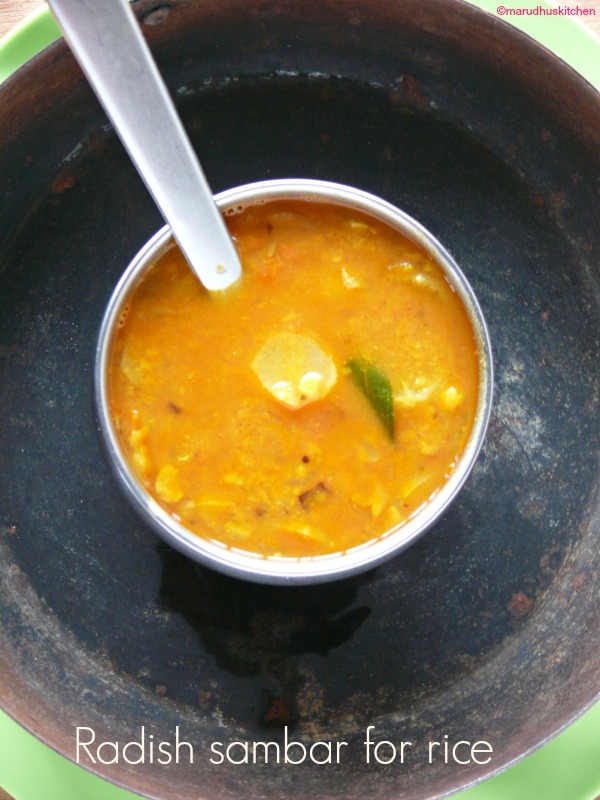 This is keertana’s favourite sambar….she will reserve all the pieces of her:)….Looks delicious Vani!! Wow radish sambhar is looking so gorgeous . Awesomw share dear !! Wow!! Flavourful sambar!! Love it!! What a lovely looking sambar, Vani! Looks so delicious! I love radish sambar.Radish gives a unique taste to sambar.Loved the story too. Sambar is my most fav with idly and dosa 😀 I always need more, Itney se mera kya hoga dear I need more!! Sambar looks perfect! !